Do the company’s current assets easily cover its current liabilities? What is the Quick Ratio? 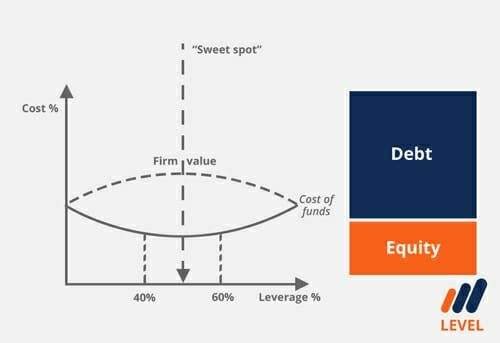 The Quick Ratio, also known as the Acid-test or Liquidity ratio, measures the ability of a business to pay its short-term liabilities by having assets that are readily convertible into cashCash EquivalentsCash and cash equivalents are the most liquid of all assets on the balance sheet. Cash equivalents include money market securities, Bankers Acceptances, Treasury bills, commercial paper, and other money market instruments.. These assets are, namely, cash, marketable securitiesMarketable SecuritiesMarketable securities are unrestricted short-term financial instruments that are issued either for equity securities or for debt securities of a publicly listed company. The issuing company creates these instruments for the express purpose of raising funds to further finance business activities and expansion. and accounts receivableAccounts ReceivableAccounts Receivable (AR) represents the credit sales of a business, which are not yet fully paid by its customers, a current asset on the balance sheet. Companies allow their clients to pay at a reasonable, extended period of time, provided that the terms are agreed upon.. These assets are known as “quick” assets since they can quickly be converted into cash. 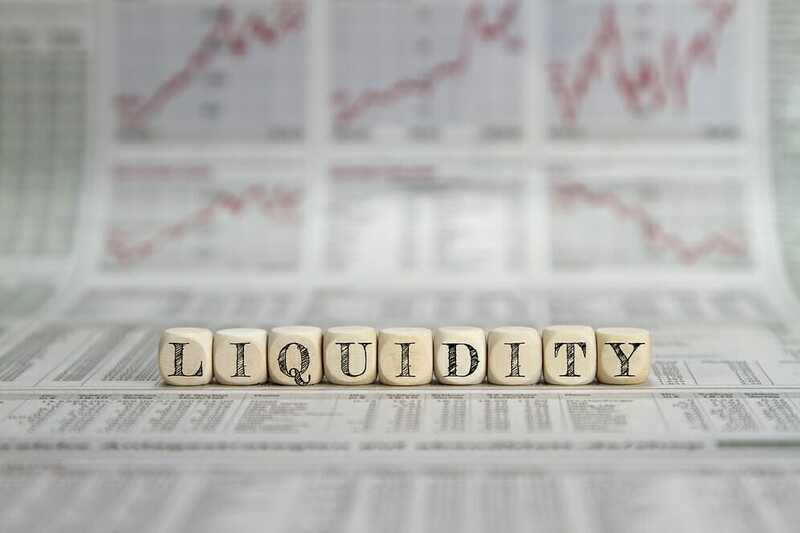 This company has a liquidity ratio of 5.5, which means that it can repay its current liabilities 5.5 times-over using its most liquid assets. A rate above 1 strongly suggests that a business has enough cash or cash equivalents to pay expenses or loans and sustain its operations. This formula takes cash plus securities plus AR and then divides that total by AP (the only liability in this example). As you can see, the ratio is clearly designed to assess companies where short-term liquidity is an important factor, and hence it is commonly referred to as the Acid Test. The quick ratio is the barometer of a company’s capability and inability to pay its current obligations. Investors, suppliers and lenders are more interested to know if a business has more than enough cash to pay its short-term liabilities rather than when it is not. Having a well-defined liquidity ratio is a signal of competence and sound business performance that can lead to sustainable growth. To learn more about this ratio and other important metrics, check out CFI’s course on performing financial analysis. 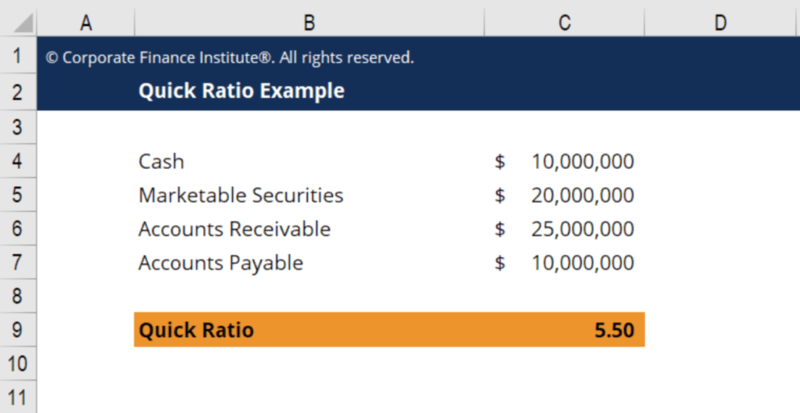 The quick ratio is different from the current ratioFinanceCFI's Finance Articles are designed as self-study guides to learn important finance concepts online at your own pace. Browse hundreds of finance articles and guides to learn about the cost of capital, financial analysis, ratios, multiples, rates of return, profitability metics, and how to evaluate the overall as inventory and prepaid expense accounts are not considered in quick ratio because generally, inventories take longer to convert into cash and prepaid cannot be used to pay current liabilitiesCurrent LiabilitiesCurrent liabilities are financial obligations of a business entity that are due and payable within a year. A company shows these on the balance sheet. A liability occurs when a company has undergone a transaction that has generated an expectation for a future outflow of cash or other economic resources.. For some companies, however, inventories are considered a quick asset, although that depends entirely on the nature of the business and these cases are extremely rare. Thank you for reading this guide to understanding the Acid Test as a measure of a company’s liquidity. CFI is the official provider of the FMVA CertificationFMVA™ CertificationThe Financial Modeling & Valueation Analyst (FMVA)™ accreditation is a global standard for financial analysts that covers finance, accounting, financial modeling, valuation, budgeting, forecasting, presentations, and strategy. for financial modeling analysts. This program focuses heavily on Excel, accounting, and financial modeling skills. Forward PE ratioForward P/E RatioThe Forward P/E ratio divides the current share price by the estimated future (“forward”) earnings per share (EPS). For valuation purposes, a forward P/E ratio is typically considered more relevant than a historical P/E ratio. P/E ratio example, formula, and downloadable Excel template.